How to Use Free File Sync in AOMEI Backupper? How to make one folder update automatically when you update the other folder, AOMEI File Sync will help you freely do that. You don’t need to update two folders respectively, and can be easy to synchronize one folder to the other folder. File Sync, is the short for File synchronization. It is an utility that has the ability to synchronize multiple pairs of folders or files, and has been designed to be easy to use and quick to update two folders in two different places. AOMEI File Sync, is a new function of AOMEI Backupper, also, is a free utility to synchronize and back up files which are stored in laptop, desktop or external storage device. Whatever email, digital photos, MP3, etc, they can be synchronized and backed up to the other place easily. 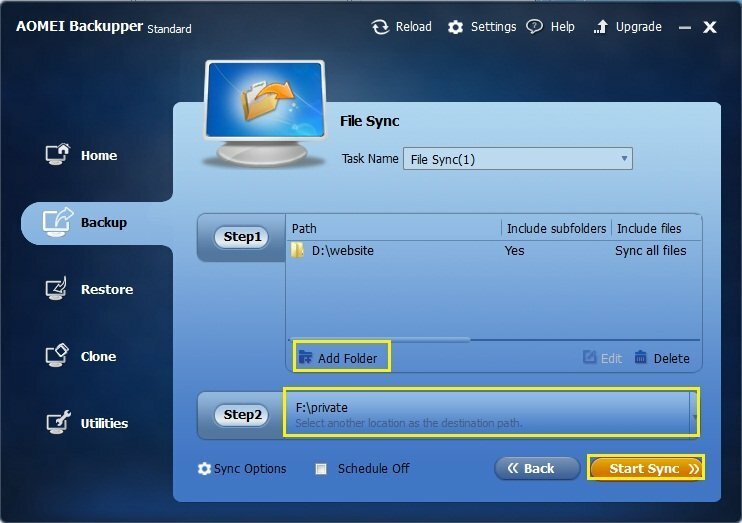 Powerful one-way sync function: it supports to synchronize all files from one folder to the other folder. It can be used combing with other functions, such as schedule, and file sync service will monitor relevant folders. It supports schedule sync: scheduled sync can help you synchronize folders at the fixed time. You can set month, week and day in schedule. When it reach the specific time point, AOMEI File Sync will synchronize folder automatically. It can synchronize folders to cloud storage drive indirectly: you can download a client of cloud storage drive, and it will create installment directory. You just need synchronize your folders to corresponding directory, and client will upload your folders to cloud. Network sync: AOMEI File Sync can not only synchronize folder to local disk or removable device, but also to other computers within LAN, and NAS. It is good for sharing files with others. How to use AOMEI File Sync? 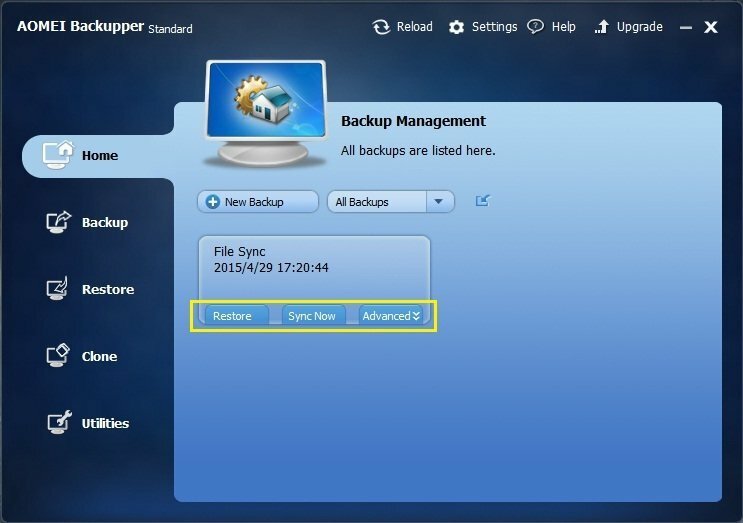 Step 1: Please download and install AOMEI Backupper , and select "Backup". 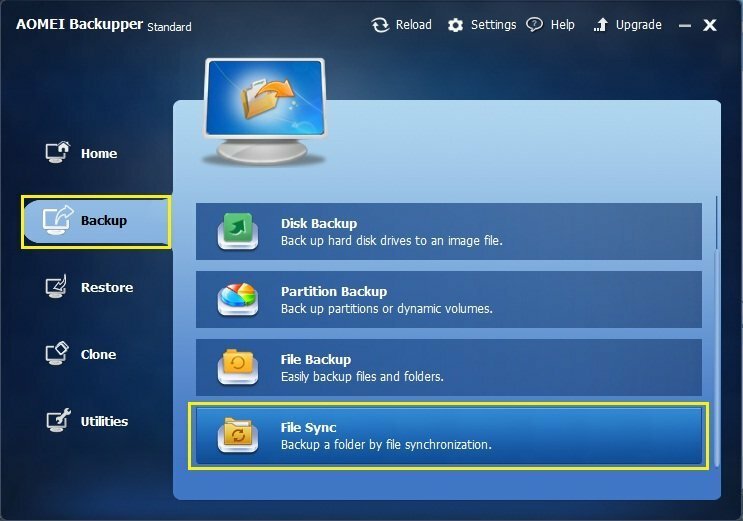 You can roll to "File Sync" in "Backup" Option, and then select it and you will see the interface just like the picture below. Step 2: Associate two folders. Click "Step1" to add the folders that you want to synchronize, and click "Step2" to select one folder that will be synchronized. After adding, you can click "Start Sync". Tips: There are two options at the lower left, and you have other demands on File Sync. Sync Options: it contains comments and notification. You can comment on file to distinguish from others, and set up email configuration information to remind you regularly to synchronize relevant folders. Scheduled Off: it can set up schedule to synchronize file, and schedule contains month, week and day. With only two steps, you can finish file sync. If you want to manage the folders that are applied with File Sync, you can find the task in Home. You can do some operations through the button under the task. Restore: it can restore all files in the target folder to the source folder or other folder. Sync Now: it can synchronize all files in source folder to target folder. Usually, it is used on task that is not applied with schedule. In other word, it is manual sync. Advanced: there are many operation functions in Advanced to meet your more demands. You can set schedule sync, and edit sync. If you want check folder, you can select "Open Sync", or if you want to give up this task, you choose "Delete Sync". All information can be read in "Properties". File or folder can’t be synchronized to CD-ROM/DVD/Blue-Ray. The single file whose space volume is more than 4GB can’t be synchronized to FAT/FAT32 partition, because the FAT32/FAT only supports file whose space volume up to 4GB. It does not support two-way sync currently. In other word, it only support to synchronize folder A to folder B currently, but can’t do it from folder B to Folder A. For more matters needing attention about File Sync, please visit FAQ about AOMEI File Sync.